Free Screening — Soundasaurus in Calgary Tonight! A quick reminder to all in the Calgary area about the free screening at the Soundasaurus festival at the EPCOR centre tonight, January 7th at 7:30 pm. 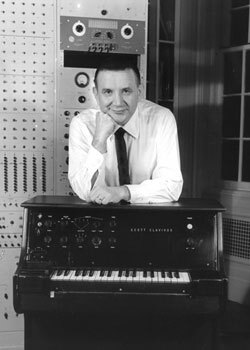 This event will be truly unique as the Clavivox, Raymond Scott’s early proto keyboard synth will be on exhibit. As far as anyone knows, this is the sole remaining example of that instrument (I think only four were built). The first version was built around a Theremin assembled by Robert Moog. I’ve arrived in Calgary today, and will be there tomorrow, so if by chance you live in that part of the world, hope to see you there.